Free Comic Book Day was a tour de force this year, one that took me on a number of road trips, some of which are only ostensibly connected to FCBD, so we're going to have to deal with that. This year's event also brought Duane Redhead to the United States for the first time, and I had the pleasure of meeting him and getting to spend some time with the man who draws The Tick. I picked Duane up in New York (after a harrowing airport experience), we drove to Boston, Pittsburgh and then back to New York for a total of eight days of at times manic travel, book signings and sightseeing. Let's see some pictures, along with some wonderful commentary along the way. After a terribly rainy Wednesday and lots of driving, Duane and I spent Thursday in New York City. Here's me...at the Empire State Building. I've been waiting to take this picture for years. Duane Red at Duane Reade. It was destined to happen. After the ESB, we made our way to the New York Public Library, which was, of course, very impressive. They had an exhibit on children's literature (including some comics) and I got to see a true-to-life Gutenberg Bible. We also checked out Grand Central Terminal, which Duane recognized from a video game. Times Square is home to Midtown Comics, and...hey, is that...? YES! It's a giant window display of THE THING! It was pretty nice inside, too. I gave the manager some copies of Teddy and the Yeti and the 2013 Tick FCBD book, and I picked up a few comics as well. Oh, and I also found a copy of FUBAR on the shelves. Pretty neat. 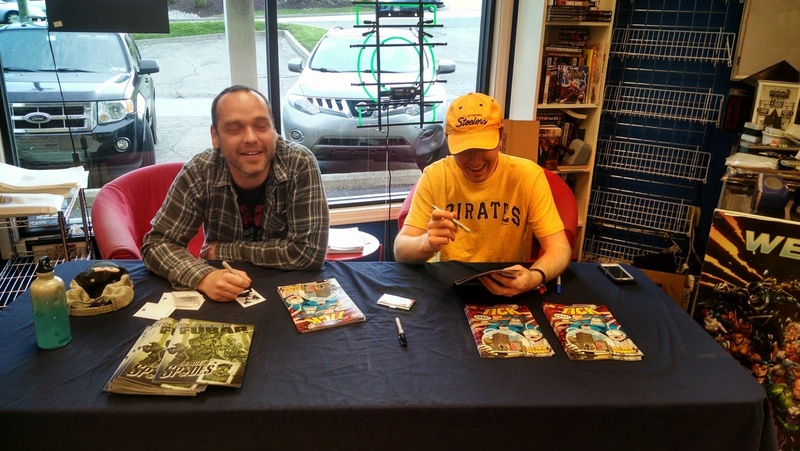 Friday brought us to Boston and New England Comics for our Free Comic Book Day signings. We each signed in different locations on Saturday. I opened up at the New Bedford location, which is the farthest south of any NEC store. It's almost in Rhode Island! The shop was small but traffic was steady for the few hours I was there. 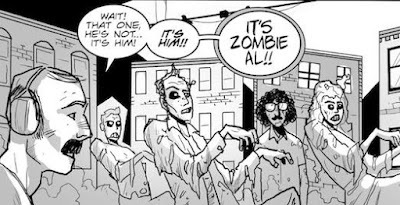 And while you're there, don't forget to take advantage of the sale on mordern age comics. My next stop was at the NEC Brockton location. This store was bigger and, even though it was later in the day, it was probably busier overall. I shared a table with the great Frank Tieri, writer of such titles as Space Punisher for Marvel (it's the Punisher...in space). Frank was a lot of fun to hang out with, and I'd like to think that we bonded with our mutual hate of Boston and Philadelphia sports teams. This fantastic Ben Edlund Tick artwork hangs in the offices of the Brockton store (love the "Drama Flakes" reference). At the end of the day, Duane showed up at the Brockton store and we signed together for a few minutes. We also took one of my obligatory miserable pictures, which I think turned out really great. Sunday brought another signing at the NEC Harvard Square location. Before the signing, we managed to sneak in a few hours of sightseeing. The annual "Mayfair" celebration was going on when we were there, so we took some of that in. We also got to take a quick tour of Harvard University and its natural history museum. Duane spent a good portion of the weekend doing sketches such as these on comic backing boards. A whole lot of people walked away with something like this when they visited the table. If I'm honest with myself (and you, blog), I probably should have swiped one of these at some point. Here's an interior shot of the Harvard Square store. It's a small store but it's probably my favorite of all the NEC locations I've been to. After the Sunday signing was over, Duane and I took the long, fairly grueling car ride to Pittsburgh, where I forced him to do Pittsburgh-y things like ride the Duquesne Incline. While on top of Mt. Washington, I saw a few of these stuck on poles. Original art on USPS stickers. Is this a thing, now? If it is, I like it. I also forced Duane to eat at Primanit Bros. 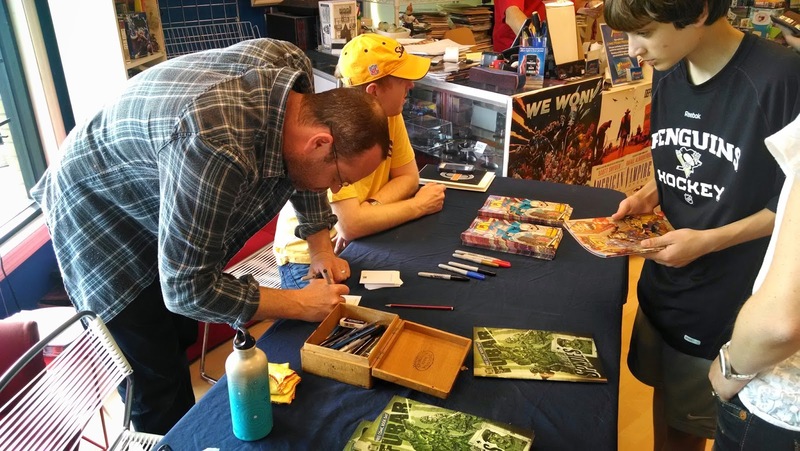 The day before Duane took back off to his home in the UK, we had another signing, this one at Pittsburgh Comics in McMurray. We signed a few books and Duane did even more sketching. Larry got a set of original art Teddy and the Yeti cards. I'm totally jealous. But Duane did draw me a Thing sketch card, so all is well. We even took an almost real picture at the end of the day, too! I'm a bit overzealous. 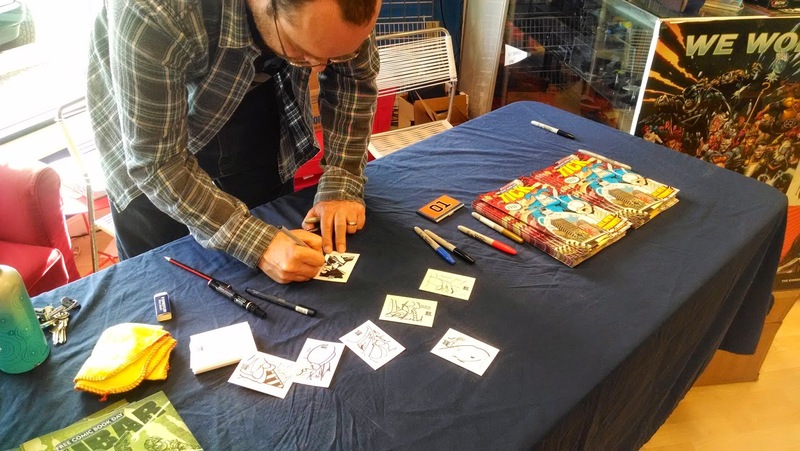 This year's FCBD event was jam packed with sights to see and things to do. I'm elated that I finally got to meet Duane, someone I've been working with for nearly seven years at this point. He's as great a guy as you'd expect, and if you expected him to be a great guy, well, then he's even greater. I'm happy that I we were able to see some of the east coast and sign some comics along the way. And yeah, of course I got him to draw in the Thing sketchbook. Obviously. IDW to publish "Imaginary Drugs"
I'm happy that I can finally announce some fairly big news for a project that I'm involved with. 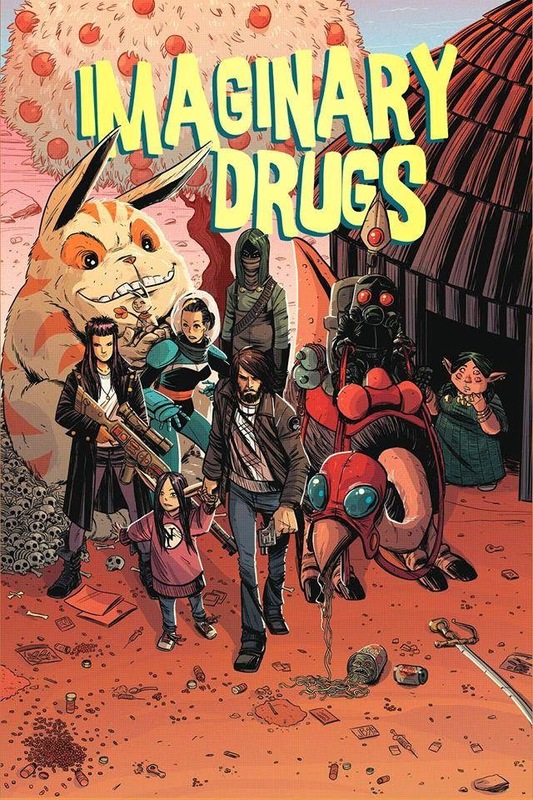 The "Imaginary Drugs" collection, which previously completed a successful Kickstarter campaign, will be published and distributed in the fall by IDW Publishing. This means a bigger print run and wider (global) distribution for the book and an overall higher profile for the concept. 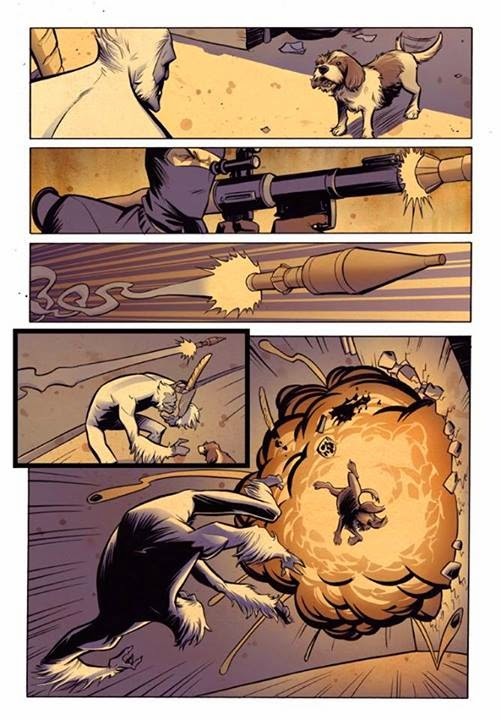 As one of the top five publishers in the country, IDW brings something to the book that it couldn't have had otherwise. In addition to these stories, there'll be a few pinups included to round out the experience. 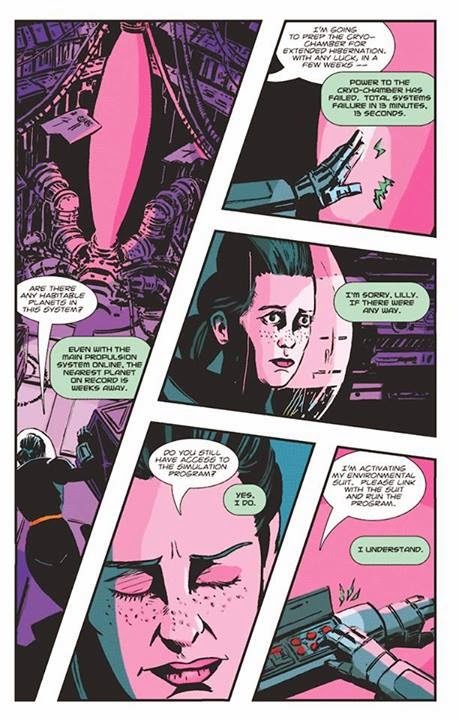 This is, all in all, fairly big news as IDW carries a bit of heft along with them. Strictly from the standpoint of who the publisher is, this will be the highest profile book I've been a part of since my very first publication by Dark Horse Comics...and let's face it, that was just about a million years ago. The Tick is more well known, of course, but IDW is a (much) bigger company, so I'm very excited to be involved. Sharp readers will remember than I had a half-page comic appear in the pages of Hawken in 2012, so I'm excited to sneak back in with this new publication. Original Kickstarter backers will still receive their rewards as listed, including a limited "guerilla-style" copy of the book. I'll post more updates as they're available. Feel free to check out the official ID Facebook page for previews from different stories. Spread the word.